When you are attending a panel, please silence your cell phones and other mobile devices. If you must take a call, please leave the panel room before starting your conversation. The panelists and your fellow audience members thank you. For the most up-to-date schedule, as well as maps and other useful information, check out the Guidebook app available on the Android, Apple and Windows platforms. Or visit http://guidebook.com/g/NWC39 from any web browser. Some consider science fiction to originate with the American pulp magazines of the 1920’s and 30’s. However, the more commonly cited origin of science fiction is Frankenstein; or, The Modern Prometheus by Mary Shelley, first published in London in 1818. The visible universe contains about 50 billion galaxies. There are between 100 billion and 1 trillion stars in the average galaxy. In the Milky Way alone, there could be as many as 100 million planets. If humanity is indeed alone, those are some pretty ridiculous odds. 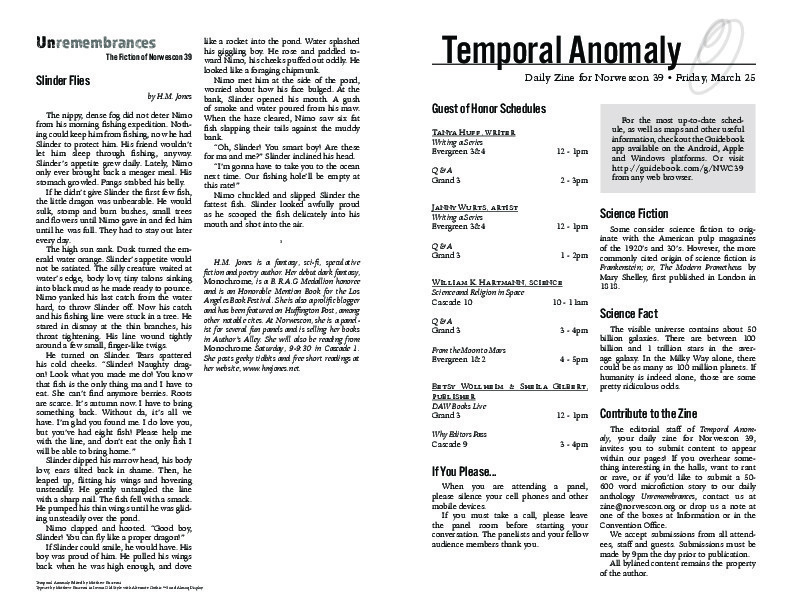 The editorial sta of Temporal Anomaly, your daily zine for Norwescon 39, invites you to submit content to appear within our pages! If you overhear something interesting in the halls, want to rant or rave, or if you’d like to submit a 50-600 word microfiction story to our daily anthology Unremembrances, contact us at zine@norwescon.org or drop us a note at one of the boxes at Information or in the Convention Office. We accept submissions from all attendees, staff and guests. Submissions must be made by 9pm the day prior to publication. All bylined content remains the property of the author. All words are related to the Norwescon 39 conference location and its denizens (or are they?) Can you catch find them all? Body Horror (HOR07): Arinn Dembo (M), Jeremy Zimmerman, Jason Bourget, Lisa Bolekaja. Cold Exobiology (BIO04): Pat MacEwen (M), Stephen L. Gillett, Marguerite Reed. Grab your morning bagel and OJ, then head down to Grand 3 for Keith and Alan’s Movie News and Previews. From 10 to Noon, then it’s over. So much genre stuff to talk about; movies, TV, theme parks, the whole gamut. Grab your seat early for all the latest! Now you can play the actual Card Wars game from the show! Based on the original Adventure Time episode featuring “Card Wars,” where Finn and Jake battle against each other to decide who will be the Dweeb and who will be the Cool Guy. A delectable dish has been spotted in the hotel cafeteria. The Chewbacca Dog 3.0, a special treat for Norwescon 39 attendees, promises to be a 100% beef hotdog with pulled pork, aged cheddar cheese, and applewood bacon on a hoagie. Only $8.95. The nippy, dense fog did not deter Nimo from his morning fishing expedition. Nothing could keep him from fishing, now he had Slinder to protect him. His friend wouldn’t let him sleep through fishing, anyway. Slinder’s appetite grew daily. Lately, Nimo only ever brought back a meager meal. His stomach growled. Pangs stabbed his belly. If he didn’t give Slinder the first few fish, the little dragon was unbearable. He would sulk, stomp and burn bushes, small trees and flowers until Nimo gave in and fed him until he was full. They had to stay out later every day. The high sun sank. Dusk turned the emerald water orange. Slinder’s appetite would not be satiated. The silly creature waited at water’s edge, body low, tiny talons sinking into black mud as he made ready to pounce. Nimo yanked his last catch from the water hard, to throw Slinder off. Now his catch and his fishing line were stuck in a tree. He stared in dismay at the thin branches, his throat tightening. His line wound tightly around a few small, finger-like twigs. Slinder dipped his narrow head, his body low, ears tilted back in shame. Then, he leaped up, flitting his wings and hovering unsteadily. He gently untangled the line with a sharp nail. The fish fell with a smack. He pumped his thin wings until he was gliding unsteadily over the pond. If Slinder could smile, he would have. His boy was proud of him. He pulled his wings back when he was high enough, and dove like a rocket into the pond. Water splashed his giggling boy. He rose and paddled toward Nimo, his cheeks puffed out oddly. He looked like a foraging chipmunk. Nimo met him at the side of the pond, worried about how his face bulged. At the bank, Slinder opened his mouth. A gush of smoke and water poured from his maw. When the haze cleared, Nimo saw six fat fish slapping their tails against the muddy bank. “Oh, Slinder! You smart boy! Are these for ma and me?” Slinder inclined his head. Nimo chuckled and slipped Slinder the fattest fish. Slinder looked awfully proud as he scooped the fish delicately into his mouth and shot into the air. H.M. Jones is a fantasy, sci-fi, speculative fiction and poetry author. Her debut dark fantasy, Monochrome, is a B.R.A.G Medallion honoree and is an Honorable Mention Book for the Los Angeles Book Festival. She is also a prolific blogger and has been featured on Huffington Post, among other notable cites. At Norwescon, she is a panelist for several fun panels and is selling her books in Author’s Alley. She will also be reading from Monochrome Saturday, 9-9:30 in Cascade 1. She posts geeky tidbits and free short readings at her website, www.hmjones.net. Matthew Buscemi, “Temporal Anomaly (Friday),” Norwescon History, accessed April 20, 2019, http://history.norwescon.org/items/show/203.